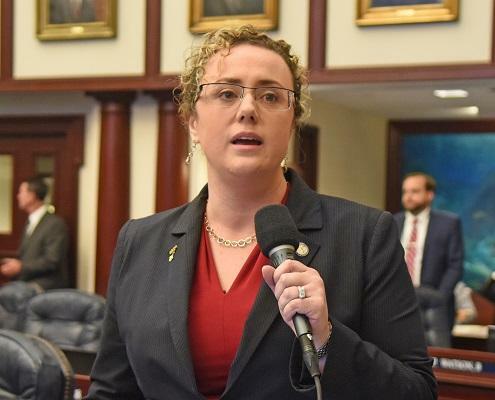 Erin Grall (R-Vero Beach) sponsors a bill that requires physicians to obtain the notarized written consent of a parent or legal guardian before terminating the pregnancy of a minor. A bill (HB 1335) requiring minors to get a parent’s consent for abortions passed a House committee this week. The debate was mostly civil, but some audience members had to be escorted out. Florida law says parents have to be notified when their daughters seek abortions. Under the proposal, parents would have to give their permission. The House Health Quality Subcommittee heard from a string of women who’ve had abortions, but who have differing opinions about the bill. “I had an abortion and I’m over 65 years old, and it haunts me every day,” said Barbara Mayall as she testified in support of the bill. The bill includes exemptions for minors who have health emergencies or who already have children. Minors could also ask a judge to waive the parental-consent requirement. Rep. Cord Byrd (R-Neptune Beach) said debate over the proposal is worthy because minors need permission for just about everything. “When I heard the people in opposition, not one, not one person said why this procedure - which is a medical procedure performed by a medical doctor - is any different than any other medical procedure performed in the state of Florida by a physician on a minor that requires parental consent,” Byrd said. Rep. Jennifer Sullivan (R-Mount Dora) tried to explain why she supports the bill, but committee Chairwoman Colleen Burton (R-Lakeland) had to jump in when audience members started interrupting. “The majority of opposition we’ve heard today is from those who stand to gain financially from these children moving forward with this procedure,” Sullivan said. Then Burton stopped the debate to ask a member of the audience to leave. The protester was Barbara DeVane, a lobbyist for the Florida National Organization for Women, which opposes the bill. DeVane left, then there was another interruption from the audience. Sante Fe College student Heather-Ann Irons yelled that she wasn’t an abortion provider and had nothing to gain financially from opposing the bill. The legislation passed the committee 10 to 4. A Senate version has not yet been heard by a committee. ~News Service of Florida contributed to this story. The Florida Legislature is looking to impose new restrictions on abortion. A measure that would ban a common procedure passed a divided House committee Thursday. A Florida district court has denied a pregnant minor’s appeal to avoid notifying her parents she planned to have an abortion. The ruling stems from a 2004 state constitutional amendment requiring parents to be notified before teenage daughters terminate pregnancies.